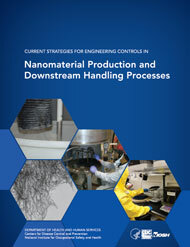 The focus of this document is to identify and describe strategies for the engineering control of worker exposure during the production or use of engineered nanomaterials. Engineered nanomaterials are materials that are intentionally produced and have at least one primary dimension less than 100 nanometers (nm). Nanomaterials may have properties different from those of larger particles of the same material, making them unique and desirable for specific product applications. The consumer products market currently has more than 1,000 nanomaterial-containing products including makeup, sunscreen, food storage products, appliances, clothing, electronics, computers, sporting goods, and coatings. As more nanomaterials are introduced into the workplace and nano-enabled products enter the market, it is essential that producers and users of engineered nanomaterials ensure a safe and healthy work environment.